Mr. J. Ben Watkins graduated from Stetson University College of Law in 1949. While maintaining a trial practice in Tallahassee, and later in Apalachicola, J. Ben Watkins served on the Board of Overseers of Stetson University College of Law. He clerked for Florida Supreme Court Justice Tom Sebring, served as director of the Florida Trial Lawyers' Association, and was President of the Franklin County Bar Association. He established the J. Ben Watkins Private Foundation to assist the less fortunate and to further the educational goals for the less fortunate. In grateful appreciation for Mr. Watkins' support and contributions to Stetson Law Review, as well as his continuing efforts and devotion to his community, SLR proudly established the “J. 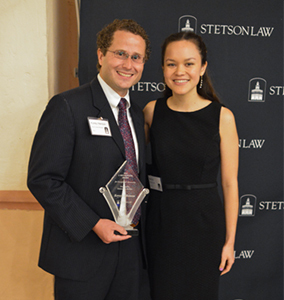 Ben Watkins Award for Professional Excellence in the Practice of Law.” This distinguished award is presented annually to an attorney selected by the Stetson Law ReviewExecutive Board. The award exemplifies J. Ben Watkins' importance to the law school and the legal profession. Associate Director of Career and Professional Development at Stetson University College of Law. Judge for the United States Court of Appeals for Veteran Claims. White-collar, criminal defense, and complex civil litigation attorney. Environmental Attorney with Environmental Protection Commission of Hillsborough County. Former Vice Mayor for the City of City of Safety Harbor. Gary R. Trombley Family White-Collar Crime Research Professor at Stetson University College of Law. Magistrate Judge for the United States District Court of the Middle District of Florida. Justice for the Florida Supreme Court. Chief Justice for the Florida Supreme Court. Partner at Boies Schiller Flexner. Former President of the American Bar Association. United States Bankruptcy Judge for the Middle District of Florida. Founding Shareholder at Hill Ward Henderson. Shareholder at Banker Lopez Gassler. Former Judge of the Second District Court of Appeal of Florida. Former Justice for the Florida Supreme Court. Former Senior Judge for the United States Court of Appeals for the Eleventh Circuit. Judge for the United States District Court for the Middle District of Florida. Former Partner at Holland & Knight. Former Judge for the Second District Court of Appeal of Florida. Senior Judge for the United States District Court for the Middle District of Florida. Former Judge for Thirteenth Judicial Circuit of Florida. Former Chief Judge for the United States Court of Appeals for the District of Columbia. Judge for the First District Court of Appeal of Florida. Former Chief Judge for the Second Judicial Circuit of Florida. Senior District Judge for the Middle District of Florida. Former Chief Justice for the Supreme Court of Georgia. Former Chief Justice for the Florida Supreme Court. Former Circuit Judge for the Sixth Judicial Circuit of Florida. Former president of the Florida Conference of County Judges. Former Judge for the Fifth District Court of Appeal of Florida. Judge for the United States Court of Appeals for the Eleventh Circuit. Former United States Attorney for the Middle District of Florida. Judge for the Iran-United States Claims Tribunal in The Hague. Former Judge for the United States Court of Appeals for the Eleventh Circuit.